Today the north end of St. Catharines, the area between downtown St. Catharines and Lake Ontario, is a fully developed residential area. This wasn't always the case; even just 50 years ago the area was still mostly farmland. From 1881 - 1932 the area was also the route of the 3rd Welland Canal as it left Port Dalhousie and headed southeast toward the escarpment. Considering the size of the canal, its hard to believe that there are so few signs that the canal once crossed the city's north end. A process of cleaning up the channel started after the 4th Welland Canal started operating in 1933. By the 1960's the length nearest Port Dalhousie was still left untouched but was steadily utilized as development continued north toward Lake Ontario. In the end only about 1 km of channel closest to Port Dalhousie escaped complete landscaping. It's in this last section that several historical landmarks including lock 2 and lock 4 of the third Welland Canal can still be found. 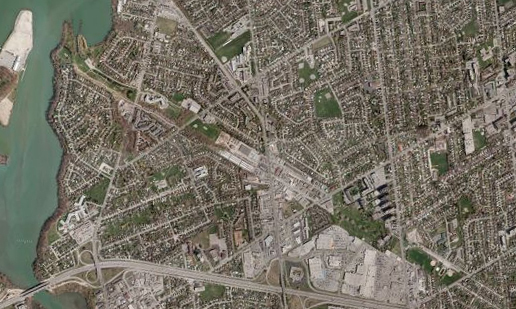 St. Catharines from top left to bottom right of photo. Since the channel is mostly forgotten, I decided to walk it's length to see what effect the 3rd Welland Canal still had on the city. Granted this may be one of the more unusual walking tours but it was still interesting to see what I came up with. Because of the length I divided the tour into seven sections based on major streets crossed by the canal. 1. Mart. Pond - Ontario St.
2. Ontario St. - Lake St.
3. Lake St. - Geneva St.
4. Geneva St. - Vine St. 5. Vine St. - Grantham Ave.
6. Grantham Ave. Bunting St.
7. Bunting St. - Govt Rd.